After a summer of using these three models on camping trips, for backyard BBQs, and other adventures, we wanted a final showdown. August was a scorcher here at GearJunkie HQ, with temps in the 90s and the humidity running high. We used the ambient heat last month as a gauntlet of sorts for three cooler models in a head-to-head ice deathmatch — the cooler to keep its ice longest would win, straight up. It was two high-end coolers up against an affordable option, all with pros and cons depending on the venue and food or drink type and quantity needing to be cool. 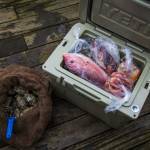 The contenders were a soft-side model from Kelty, the affordable and highly portable Folding Cooler (58 quarts, $55.95); a pricey “pro-level” icebox from YETI, the Tundra 45 model (45 quarts, $349.99); and a massive tank made by Igloo, the Yukon 70 (70 quarts, $399.99), which touts “Keeps Cold For 7 Days” right on its lid. Seven Days? Not in our test. In the August heat no cooler lasted for more than four days. We stocked 10 pounds of ice in each and let the sun and hot air do its worst. In direct sunlight, for three days the coolers took a beating. Kelty — Lid open, we dump the ice inside. It fills about halfway up a wall in the 58-quart cooler. Zip ‘er closed and step back. Igloo — 10 pounds of ice doesn’t go far in this behemoth. More than three-quarters of the inside area is empty still and gleaming white from the thick plastic walls. YETI — Pop the brown lid, dump in the frozen cubes. At 45 quarts, this is about the right amount of ice for this size case and some beverages to fit inside. Kelty — The soft-side model is struggling already to keep up with the high-end models sitting by its side. A lot of meltwater, but there’s still some ice left after a day in the 90-degree heat. Respectable. Igloo — Cold inside. Mostly solid ice, but there is a little standing water underneath. YETI — Surprised to see that almost no noticeable change has occurred. A very small amount of water at the bottom is the only sign of melting. The cubes remain fused together and very frozen. Kelty — Throw in the towel. This lightweight unit put up a valiant effort but just couldn’t handle the heat. Igloo — A little more standing water today. The giant ice chunk of fused cubes is beginning to break apart. YETI — Taking the lead! There is more standing water today, but it’s not as melted as the Igloo. Looks like we’ll know our winner tomorrow. Kelty — Down for the count. Igloo — Our biggest contender put up a fight. But all of the ice inside has melted. The YETI takes the win. YETI — With about half of its ice left, the YETI looks like it could stay cold for another day or two, but we’re getting thirsty and that Hamms beer looks good. 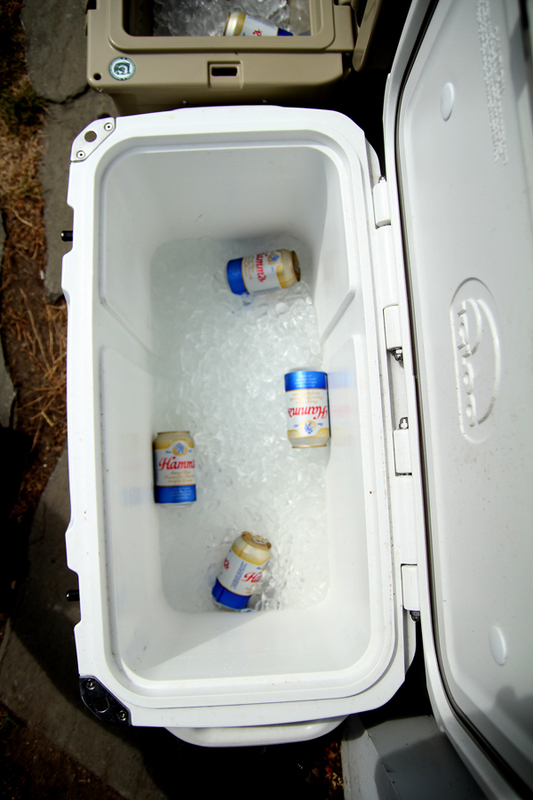 Our ice test is but one way to measure the effectiveness of a cooler. It provides a baseline for comparison, though we realize it’s far from “real world.” Indeed, we only opened the coolers once or twice each every 24 hours, far less than anyone would on a camping trip. Having only one 10-pound bag of ice in each cooler, even though all three coolers varied in size, caused some discrepancy as well. We’re not scientists, here, so take our results or leave them. The Kelty Folding Cooler is designed to be lightweight and packable. What it lacks in insulated walls it makes up for in convenience — the sides collapse down when not in use, and a hard bottom and top make it easy to carry even when loaded. Overall, the Kelty is a great option for picnics or weekend camping trips. Ice will last a good two days in general. It’s a deal, too, at just $45.95. Second-place in the “keep your ice challenge” was the Igloo Yukon 70. It is by far the biggest of the three here — you could stock a week’s worth of food in there for a couple people. While its ice didn’t last as long as the YETI’s did, we give the Yukon props for making due with ice that only filled a third or less of its container. Beyond the ice test, the Igloo is a beast of a cooler. It has a rock solid outer made of a hard rotational-molded polyethylene plastic. Integrated handles (built into the sides) make it easy to carry or tie down in the back of a truck. The lid has 3 inches of foam and is gasketed to seal tight. The unit closes with rubber latches. A tethered plug on the bottom lets you drain it at the end of a trip. An added bonus: A built-in cutting board and fish ruler on the lid make it easy to measure (and brag about) your whopper. 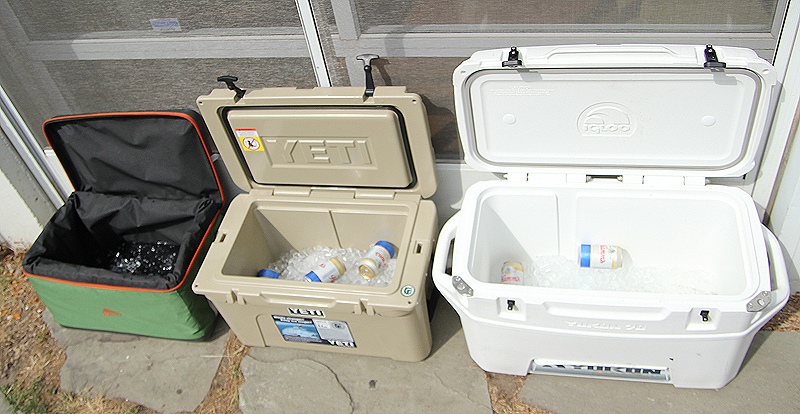 Our ice challenge winner was the YETI Tundra 45, which managed to keep its cool the longest. The 45-quart model that we tested looks bigger than the Kelty from the outside. But its walls are thick and it has a smaller interior. The YETI we tested was tough. It’s made out of a roto-molded plastic, just like what you see on a kayak hull. It weighs about 22 pounds, and the handles are rope with foam grips. The cooler bounces against your knees as you walk. 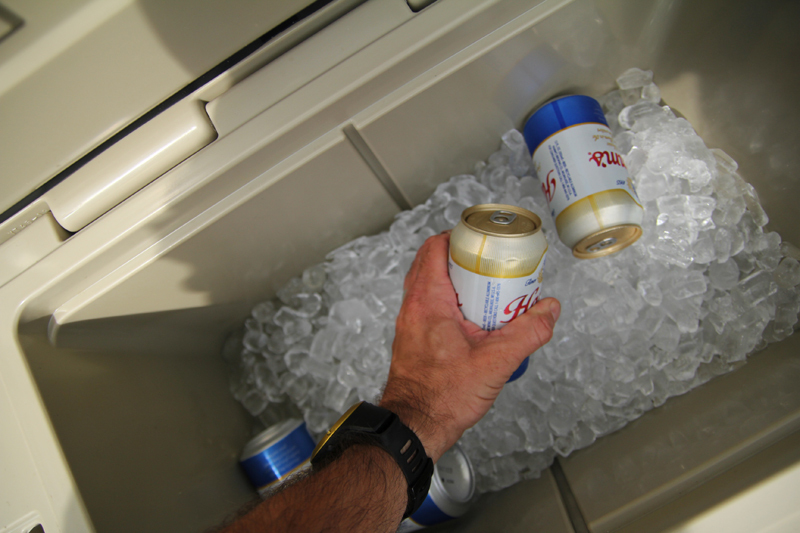 In the YETI our Hamms beers were cold with no problem for 72 hours. 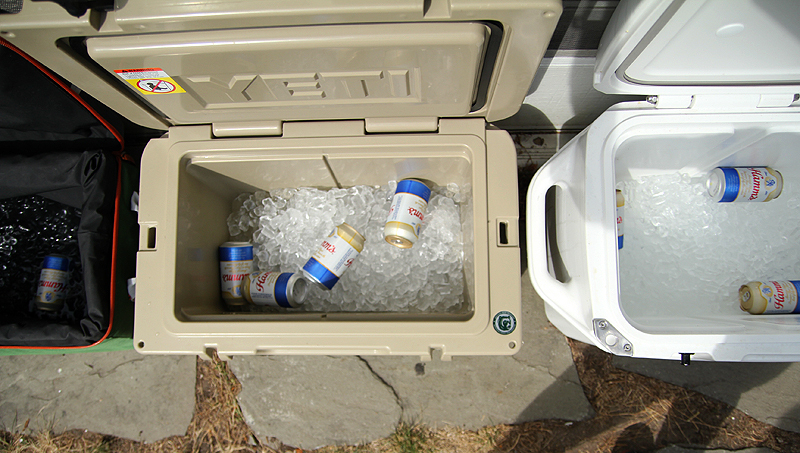 When using the YETI earlier this summer, we found it kept beer cold for a whole week (7 full days)! That’s some respectable and serious insulation. But you pay big bucks for this kind of refrigeration. The market rate for a keep-your-ice-solid-for-days vessel seems to hover around the $300 mark. Indeed, a real refrigerator might cost less on Craigslist than the YETI or the Igloo here. But then you couldn’t bring it along on a river trip or for five days driving across the American West, a cold beverage always a lid tilt away. If you want cold drinks and food for more than just a picnic or a weekend getaway, one of these pro-level coolers might be worth the investment. It’ll last for years if treated right, keeping untold quantities of food and drink cold or frozen for days at a stretch out there far away from it all.